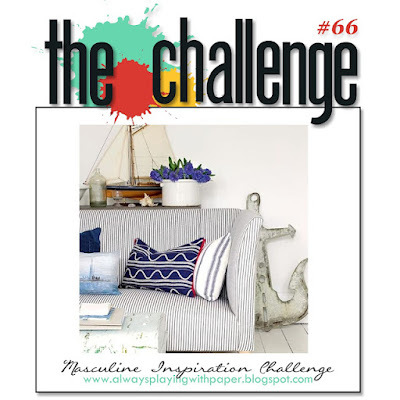 We have a new challenge for The Challenge, this week it is a Masculine Inspiration Challenge. I made use of some of the co-ordinating sheets from a 6x6 paper pad for this one. I heat embossed the sentiment and added some buttons but the paper pretty much did all the work. 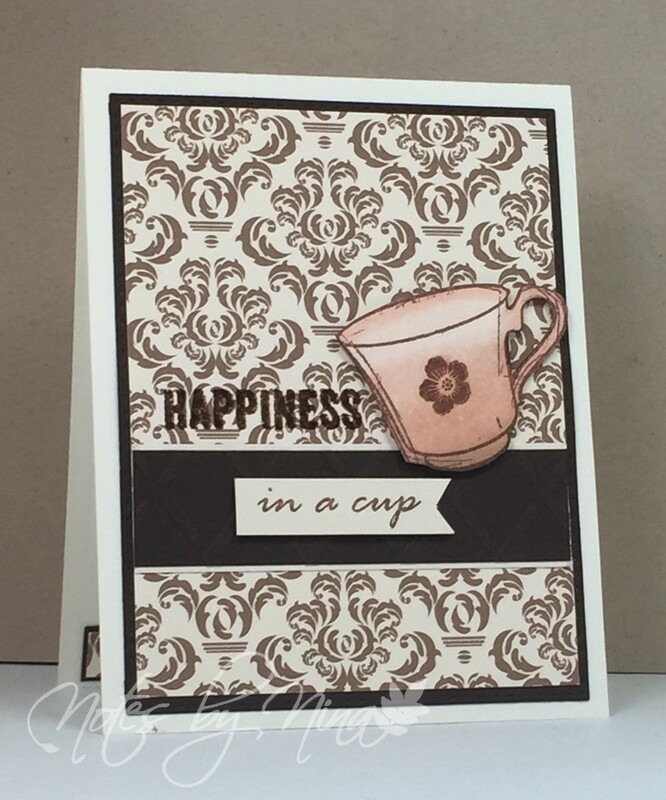 Supplies: White card stock, Designer Paper - Authentique, misc die cuts, Penny Black - Sprinkles and Smiles. Stop over at Always Playing with Paper to take a look at what the design team has created for the challenge. Good Morning, we have a new Merry Monday Christmas Card Challenge. Bonnie is our hostess this week and her challenge is to Make a Christmas card based on a Christmas Carol. I found this DP hidden away in a draw and though it was perfect for this challenge. 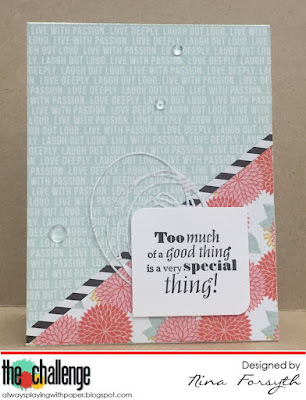 I added a popped up sentiment and some sequins and it was a pretty CAS card. Supplies: White card stock, Designer Paper - America Crafts, Verve - Bright Spirits, sequins. 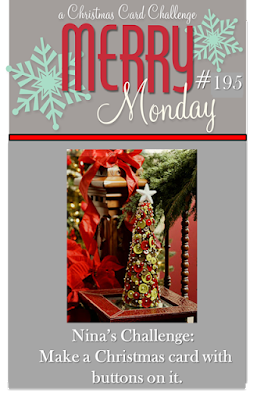 Be sure to visit the Merry Monday challenge blog to see all the Design Team inspiration. 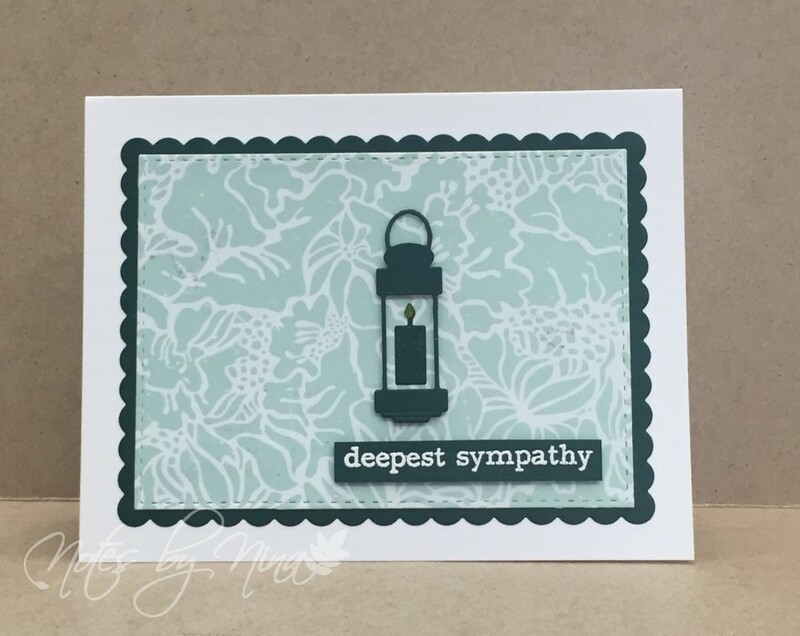 I find that I do simple sympathy cards best, CAS designs that provide a message without any flash. For this card I wanted it to have a masculine feel and the colours worked perfectly. The simple sentiment with the old fashion lantern seems to work perfectly. Supplies: Cream and green card stock, Designer Paper - My Mind's Eye Clearly Besotted - Sentimental Type, Memory Box - Bright Lanterns, misc frame dies cuts. 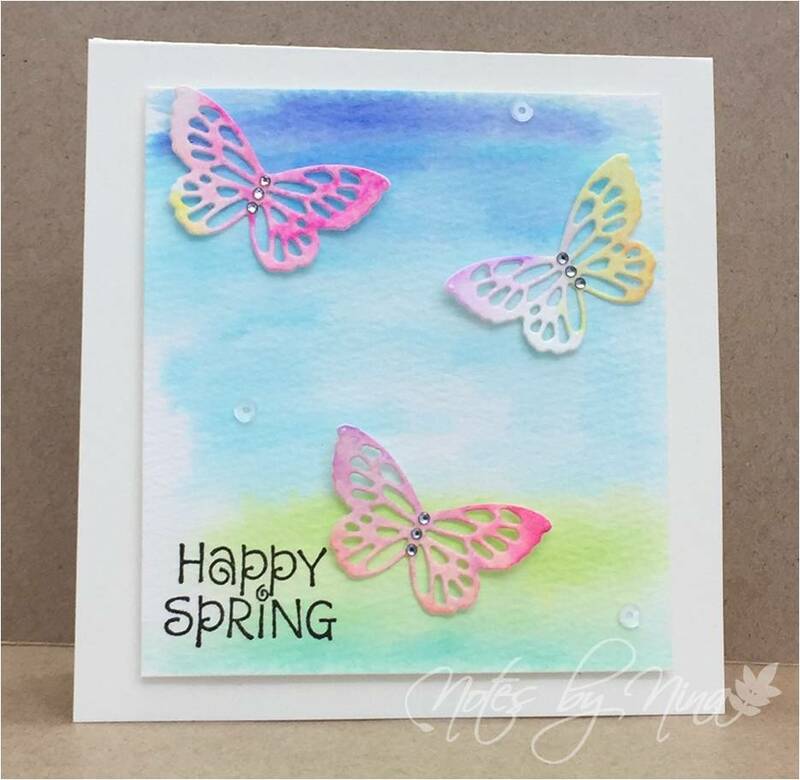 A quick card for this beautiful spring Saturday. I am going to play along with the Spring Coffee Lovers Blog Hop I think the number of participants is over 700, how can you not play along :) with all that talent, I missed the close date but I am ok with that. 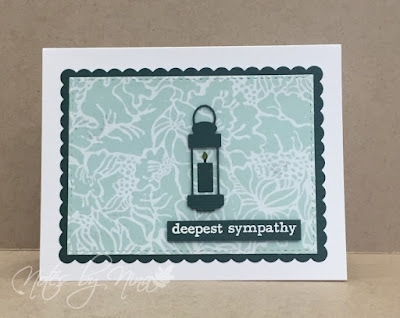 I found a scrap of this Damask DP in a drawer and I had an idea for a card right away. I used simple layers then heat embossed Happiness in brown. I added a little flag for the rest of the sentiment. The tea cup is fussy cut and coloured with Distress inks and popped up with foam tape. I added a little texture to the brown strip along the middle. Supplies: Cream and brown card stock, Designer Paper – Canvas Corp, Stampiorations – All you need is Coffee and Coffee Happy. 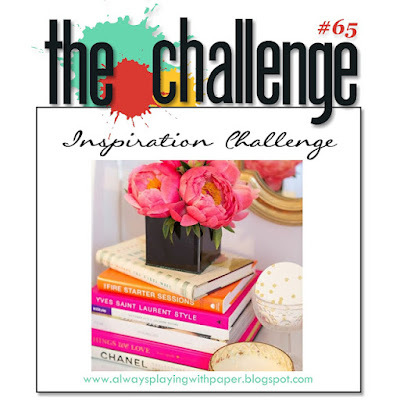 We have a new inspiration challenge for The Challenge which is a photo inspiration this week. I love the bright colours in this image. I used the flowers, the colours and the text as my inspiration this week. Supplies: White card stock, Designer Paper - Teresa Collins, Hot of the press - Heartfelt Greetings, droplets. Head over to Always Playing with Paper to take a look at what the design team has created for the challenge. We have a new Merry Monday Christmas Card Challenge. 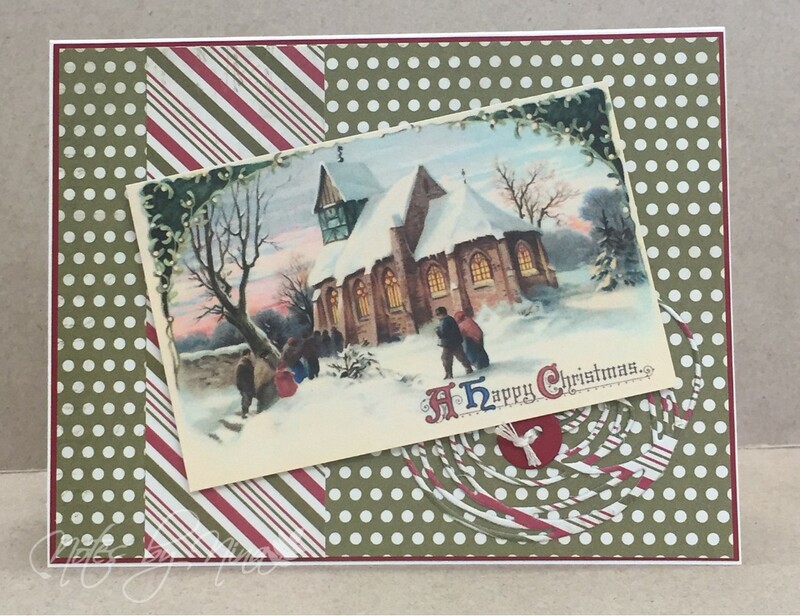 Wendy is our hostess this week and her challenge is to Make a Christmas card with a Church on it. I don't have any stamps with a Church so took a look at Pinterest and found a vintage postcard printable. I added some foam tape to the back. I added a couple of layers of DP and a button and paper swirl element. Supplies: White and red card stock, Designer Paper - Authentique, misc die cuts. Victoria finished it annual flower count last week, I not sure what the results looked like but judging by the number of cherry blossoms, crocuses and daffodils I saw it was probably a good one. We had some wicked wind and rain over the weekend but this week looks like it might turn into something spring-like. With Easter just a short hop away, I figured I should make at least a card or two. I spent a little time colouring with my watercolour pencils and some Wink of Stella. You can't see it in this picture but the bunny, clouds and eggs are all very shimmery. 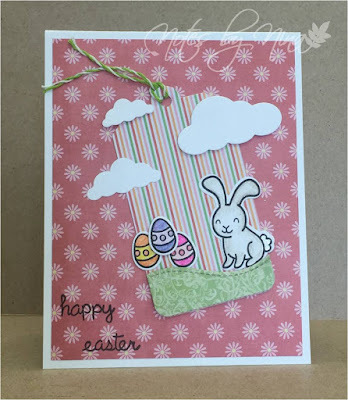 Supplies: White card stock, Designer Paper -Dovecraft, Lawn Fawn - Happy Easter, misc die cuts. 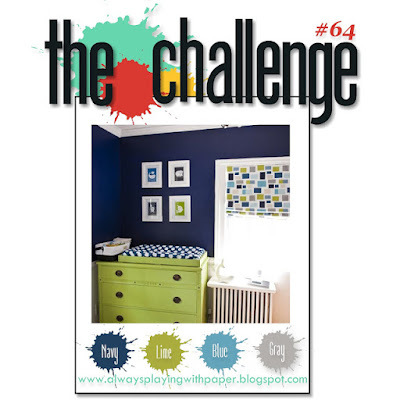 We have a new inspiration challenge for The Challenge which is a colour challenge this week. I used a gray patterned paper for the background. I then used die cuts to create and top panel and popped it up with foam tape. I used a stencils, gelato so and glass bead glitter gel. 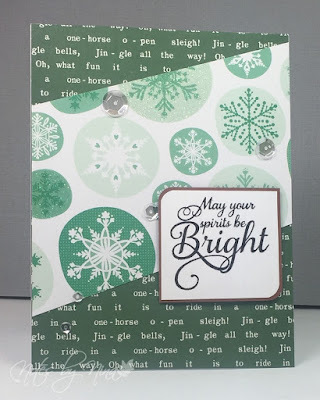 I then embossed the sentiment and popped it up with foam tape and I finished with some clear droplets. 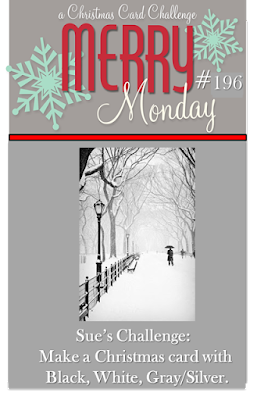 Happy Monday - we have a new Merry Monday Christmas Card Challenge. 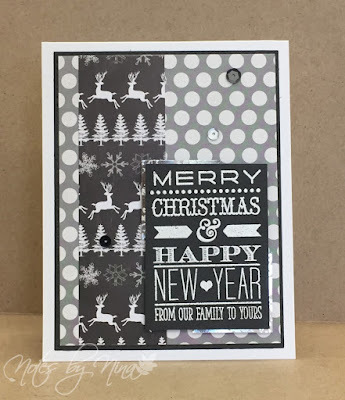 Sue is our hostess this week and her challenge is to Make a Christmas card with Black, White, Gray/Silver. 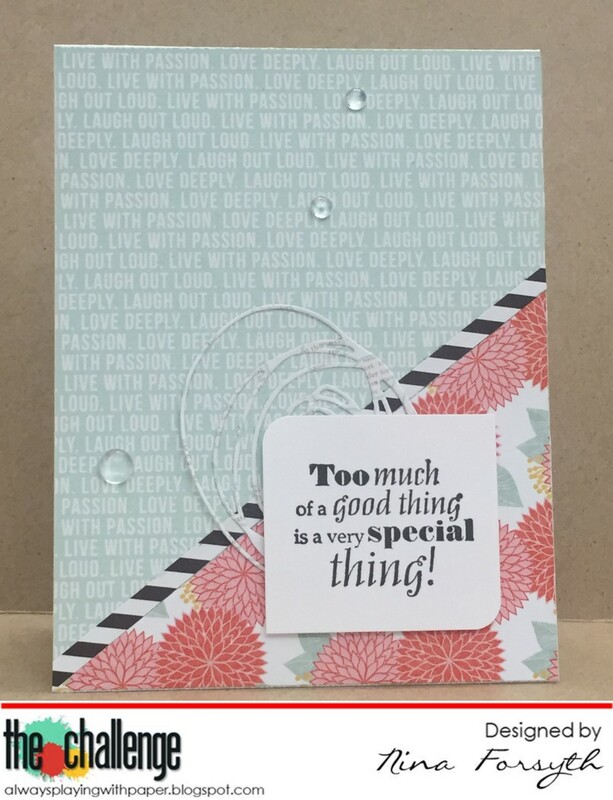 I embossed the sentiment in white on black card stock and added two corners of silver and popped it up with foam tape. I used complimentary DP for the background and finished with black and silver sequins. Don't forget to visit the Merry Monday challenge blog to see all the Design Team inspiration. Ok so the dress is not really little :), and I cased a card I made back on July of 2010. You think I would have been able to pull that off without any hitches right.. not likely :). I could not find the template that I used for that first dress, of course this morning I realized it was a card I was given for a baby shower. Too late after that fact though. So I hand drew the lines, only took me three times of cutting the cardstock to get it right.. don't ask me how I even made it to the cutting part before discovering the mistakes. Once I had the shaped card base done everything else fell into line nicely. I used the same designer paper from yesterday's card. I added some foam tape to lift the layers a little. 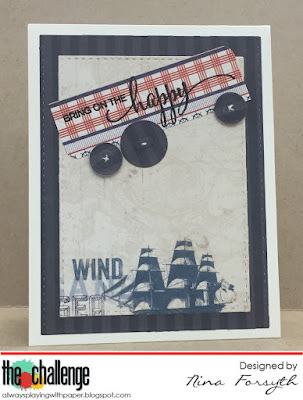 The edges are done with a border punch and I used and embossing folder to add texture. I added some ribbon and gems and then popped up the small sentiment. 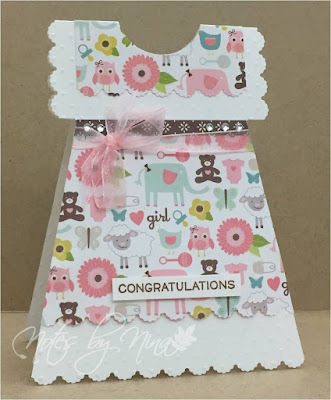 Supplies: White card stock, Designer Paper - Echo Park, Lawn Fawn - Little Bundle, gems, ribbon. 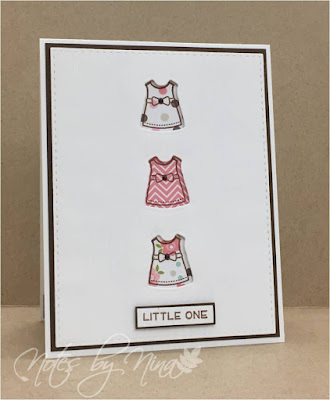 I have to admit I was charmed by these adorable little dresses, I started this card thinking it would be quick and easy to put together. However in typical Nina fashion I made it into a production. One that I am very happy with. I started out by die cutting the little dress outlines on the top panel. I then stamped three dresses on different patterned papers. I added foam to the back of the panel then lined up the stamped dresses to the die cut shapes before gluing them down. It was that step that seemed to elude me :). I finally managed to get everything all lined up and I used some Wink of Stella on the itty little dress ribbon and added a brown pearl as a button. I finished with the sentiment. Supplies: White and brown card stock, Lawn Fawn - Little Bundle, Designer Paper - Echo Park. It was nice to get a little play time in my craft space last night, even better - craft time with my favorite sister. I talked her into playing along with Bonnie and Loll's new CAS Mix Up Challenge. She is a an artist so I figured she could handle it nicely. 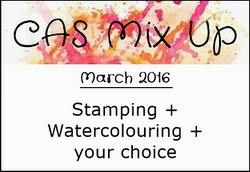 ...and CAS it is, I did a nice simple wash for the background in blues and greens. 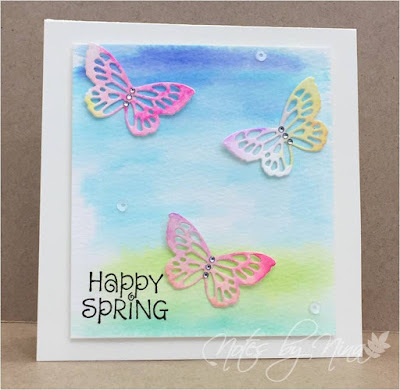 I used pinks, purples, yellow and orange for the little butterflies. Once they were completely dried I did a couple of layers of Wink of Stella for some added sparkle. I used my Zig markers for the pretty array of colours. The panel is popped up with a piece of foam, I added the sentiment and a few sequins. Another quick post for this morning, I had fun with this sketch for the current The Challenge. 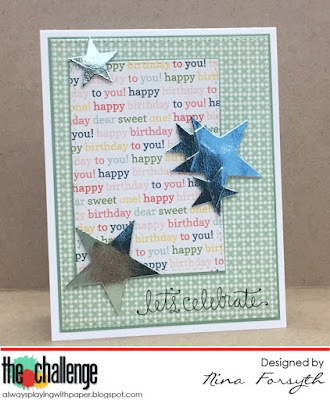 I wanted to try some foil on the stars for this card, as I loaded them into the Minc they shifted and I ended up with a little bundle all foiled together but I think turn out to be a interesting effect. 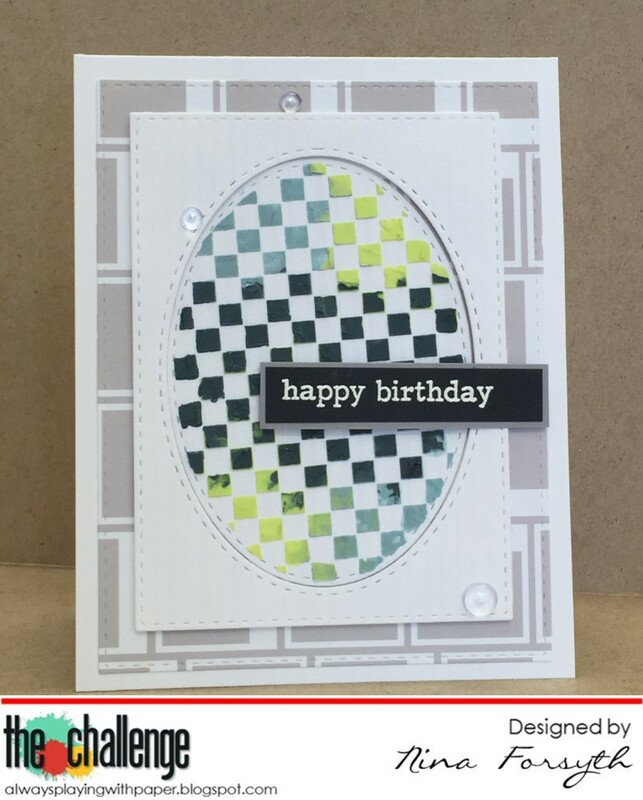 Supplies: White and green cardstock, Designer Paper - Carta Bella, Simon Says - Birthday Bits Paper Smootches - Stars. 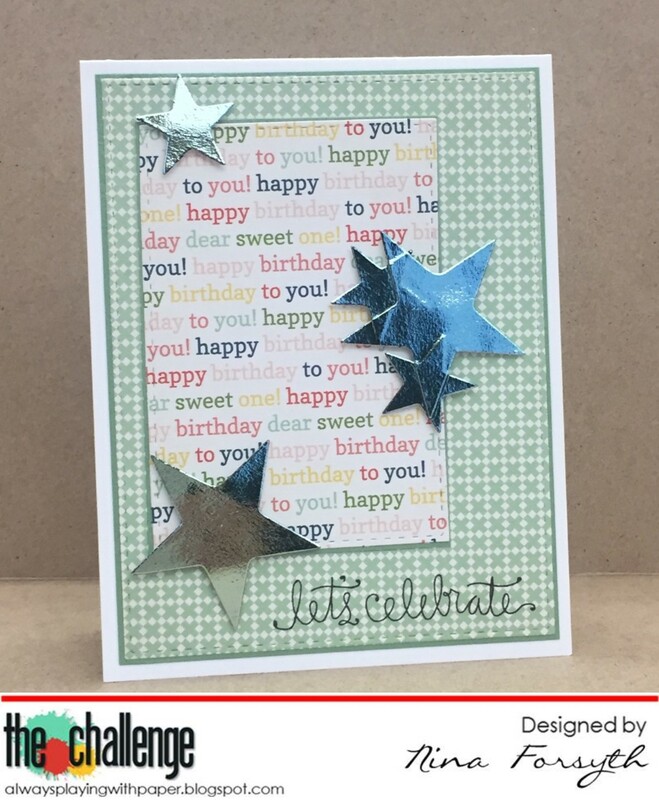 Don't forget to stop by Lesley's blog to play along with The Challenge and look at all the inspiration provided by the design team. 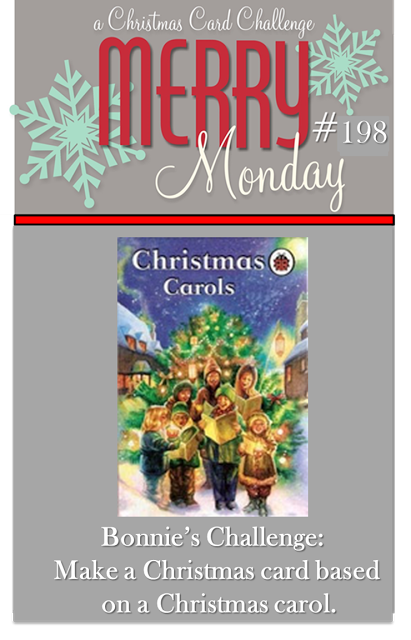 Good Morning and Happy Monday, we have a new Challenge for you for The Merry Monday Christmas Card Challenge. 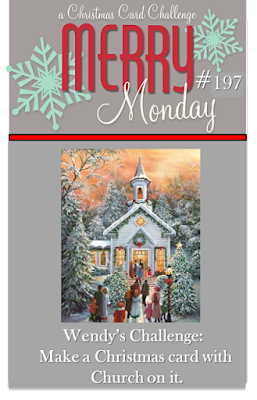 I am the hostess this week and my challenge is for you is to Make a Christmas card with buttons on it. 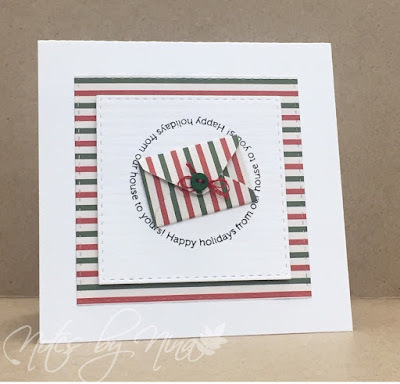 I went with a CAS design, I stamped the sentiment then added the little envelope with its mini button and red floss. Both panels are die cut with stitched squares and the center panel is popped up with foam tape. Supplies: White card stock, Designer Paper - Carta Bella, Simon Says Circle Saying Holiday, embossing floss, mini button, mini envelope punch and Simon Says stitched die cuts. 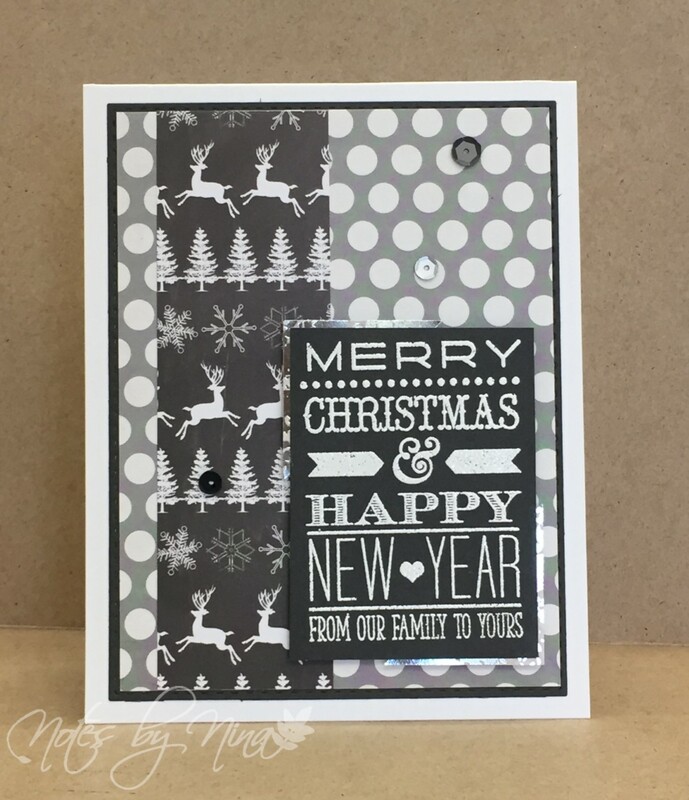 Head over to the Merry Monday Christmas card blog and see what inspiration the Design Team has created and we would love for you to play along.